I am more stubborn than you! I think I would rather eat comet than watch this movie again. For those not familiar with this movie, it features Obi wan Kenobi, I mean Alec Guinness, at his finest. I think he once said that it was one of his favourite performances. 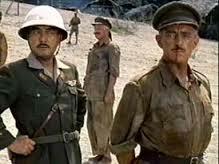 Guinness is Colonel Nicholson who is captured by the Japanese along with his soldiers. The Japanese need to finish constructing a railroad bridge and decide to use the British POWs to finish the work in time. The movie is based on a novel which is very loosely based on the real-life construction of the Burma railway. First half of the movie was quite boring and not much interesting there, although it does set the tone for the second half which is a fair bit more interesting. Guinness' acting is pretty darn good, but the whole movie was mostly just who cares. The story of how the Nicholson was such a proud British soldier that he would command his troops to build the best bridge possible in order to help the Japanese with the war in southeast Asia seems a bit weird and far-fetched, but I suppose possible. The last 20 minutes or so is really quite something to see, it is just a shame you have to sit through 2 hours of boredom to get there. Frankly this movie just makes me want to watch Star Wars. Obi wan Kenobi you're our only hope. Of the other nominees, I have only seen 12 Angry Men, and it is really quite a great movie. I can see why the Academy would pick Bridge on the River Kwai however, as it is a really big epic war movie that they seemed to be obsessed with in the 1950s and 1960s. But I much prefer 12 Angry Men and have seen it and its remake many times. So save yourself the trouble, watch Star Wars and then the original 12 Angry Men, followed up by Dr. Stangelove (as much as I like the original 12 Angry Men, I love how crazed George C. Scott gets in the remake).